You can define releases by creating them directly in your plan, importing them from a project, or linking existing releases to existing versions. # (rank) Determines the order in which the releases are scheduled. Higher-ranked releases have priority for resource assignments. Title Release name as shown in the graphical schedule, drop-down fields etc. Color Assign a color to the release stream for easy identification in the backlog graphical schedule. Short Name An abbreviation or logogram for the release; it can be used for the version number as seen in screens below, but also for a textual shortcode. Version link Allows you to see and assign a release to a version in a project. Start Date Date when the first items can be scheduled for this release. Can either be a fixed date, or relative to the release date of a previous release. End Date The planned or forecasted end date for a release. Can be fixed, or forecasted dynamically based on the desired scope. Scheduling An info column showing the scheduling mode, depending on whether a fixed or dynamic release date has been selected. 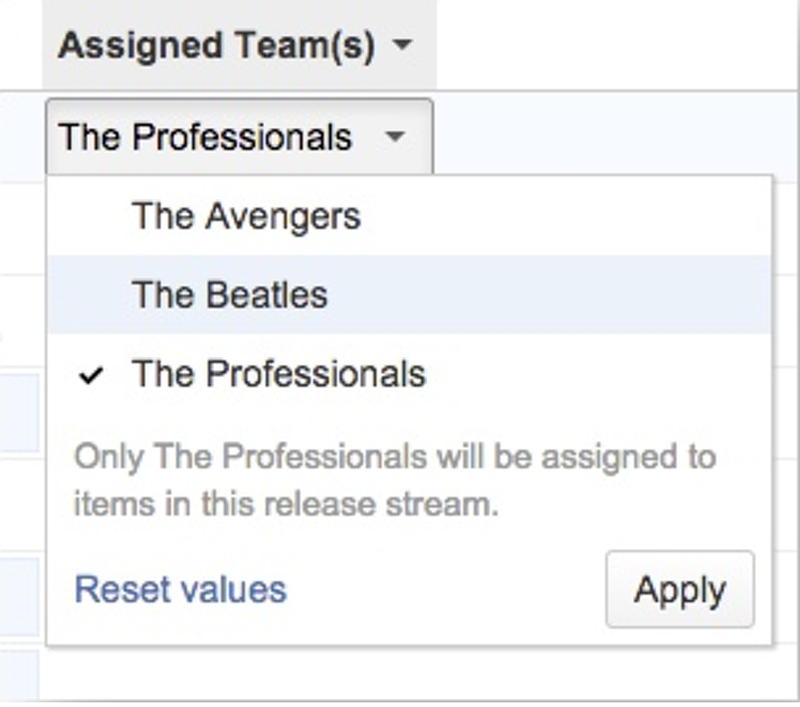 Assignable Team Specify which teams are set to work on specific release streams so that the automatic scheduler will correctly assign the right team to the right projects. A stream is composed of a set of issues and associated releases; It's delivered on its own release cadence. For example: In the following screenshot you see that the "Core Product" work stream is divided into two different releases. Select your plan and go to Releases. Create a release stream by selecting + Create Stream. Select a stream color and a short name. You can delete a stream anytime by selecting the X button next to the stream name. If you delete a stream, you can still move the backlog items to a different stream. Multiple products or products lines: When developing multiple products, each product or product family may have it's own stream of releases. Release streams are used for two product lines (A and B). If the releases are not coupled to each other and exist in separate release streams, then product A and product B can be worked at the same time (depending on team capacity). In the graphic schedule, release streams are split so that it is easy to visualize activities running in parallel on the two product lines. Parallel projects: When planning for parallel projects with separate milestones, commitments, and end dates; each project can be scheduled in an independent release stream. For example: The image below shows the use of release streams for individual customers with parallel projects being planned for each one. Each row in the graphic schedule displays the activities for a single customer. You can set a team to be dedicated to a particular release stream so that when the schedule is calculated that team is auto-assigned to backlog items within that stream. The auto team assignment based on streams can be overridden by manually selecting a team from the Assignable Teams list. Select your plan, go to Releases and locate the stream. In the Assigned Teams column, select the team or teams from the drop-down list. Once streams are defined, backlog items can be assigned to streams and releases within these streams. The release selection cell indicates both the assigned stream and the version within the stream. Locate the item and go to the Release column. Select the version from the drop down list or click Calculate to allow the item to be auto-assigned to a release in that stream. The graphical schedule offers several options for working with release streams. Timeline per stream: Splits up the view into separate lanes/timelines per stream. This is helpful to see which activities are planned for each stream over time. Coloring by streams: Colors the epics and stories by the user configurable color selected for the associated release stream. In Portfolio for Jira, a release is a set of work pieces called issues that are scheduled to be completed at a planned point. You can create a release within a stream or if you're using a blank plan, you can create a release as the main chunk of work. Relative to previous release date This option allows you to specify the amount of time gap that you want to leave once the previous release is finished and the works on the new one starts. Fixed date Release end date is set to the chosen date. In the graphical schedule you'll see a buffer if there is free capacity, or it will be shown as overbooked in red color. In many cases it is helpful to define an overlap between releases. In practice, very often even if a story is scheduled for the next version, the UI/UX Design might be completed while the previous release last feature are still in implementation or testing. An overlap generally has the semantics of "can start up to .. before the previous release ends". For example: The actual work for the second, overlapping release is only started if there are free, unused capacities that are not required for the earlier release. In the screenshot below, v2.0 is scheduled to start up to 6 weeks before v1.5 is completed, but only if enough resources are available, and therefore v1.5 still has priority). A fixed end date release is completely filled up, some epics or stories could not be scheduled into it anymore. These get pushed back into the later release. A release with a dynamic end date is defined (let's say release "2.0"), but no backlog items are assigned to it. In this case, it is assumed that these items are not supposed to be in the scope of "2.0", otherwise they would need to have a fixed assignment to it. As a result, backlog items with release set to "Calculate" will get pushed into the later release. No releases are defined at all - in that case everything is scheduled in to the later release as well and you see the projected completion date as the end date of the Later release. You can check which items fit into a particular release by using the filters. Use case example: You have a backlog full of epics, stories, fixed target release dates and you want to ship a release every month, even larger updates, three and six months from now. Configure your teams and people. Configure your releases. For the sake of the example, we'll be scheduling "Phoenix" towards the end of June, and "Mountain Goat" by mid September. Prioritize and estimate your backlog items. As soon as you have estimates for your backlog items, Portfolio for Jira will automatically schedule the items into the fixed end date releases. The scheduling algorithm of Portfolio for Jira schedules items into the fixed release end date. It considers dependencies and team's availability; depending on these factors, it might happen that a lower priority story still fits into a release, whereas a higher priority one does not. In the example below, all epics and stories could fit into either version 1.0 or version 1.5. In terms of cycle-time there is no buffer, so the last story/epic really completes with the set release date of 1.5. If you have a scope for a project and need to figure out how long it takes to complete it, configure your release with a dynamic release date. Everything that is not assigned to a release, will automatically be scheduled into the Later release. You can use fixed release assignments to add backlog items to the scope of your project. The forecasted end date is shown in the graphical display. You can import existing versions from your projects and include them in your plans by creating or adding the versions to existing release streams. Select a project. You can exclude existing linked versions. In the Import Releases window, choose the stream that your import will be linked to. 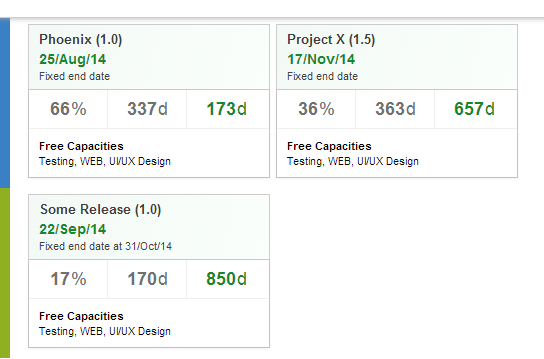 You can link existing versions in your Jira projects to existing releases in your plans. Multiple versions can be linked to a release, but only one version can be added from each project. Go to your plan > Releases. Select and mark Version Link if it's not yet checked. Locate the release you want to add a version to and select the field called Version Link. Select a project from the list and a version.